As I touched on briefly above, I’ve always found that there is something of a divide among fans on the Super Sailor Moon design. 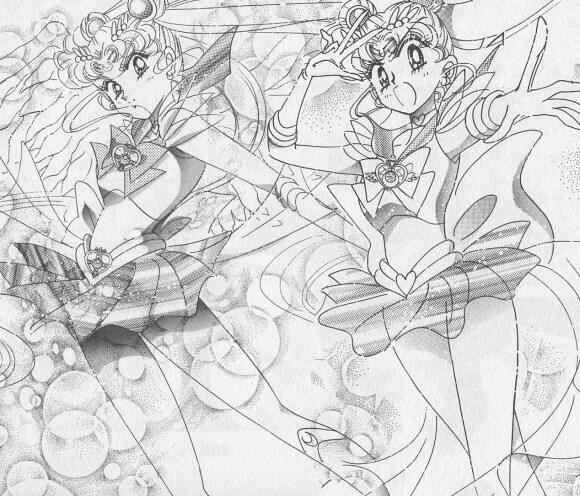 While it’s not necessarily the “canonical” design we’re used to seeing, it’s also worth keeping in mind that Usagi spent nearly half of the five year run (though, admittedly slightly more in the manga than the anime) as either Super or Eternal Sailor Moon. Though there are actually quite a few things that interest me about her new1 design, including the new colors and that this marks the beginning of a tradition where Sailor Moon’s design will constantly differ from the rest of the Sailor Team, what interests me most about the design is that she now has a brooch on her chest as well as on her waist. And now that I think about it, I guess you could call it a belt buckle brooch. But I’m already committed to the term “waist brooch,” and I refuse to rewrite anything. We’ll pretend I’ve never been to Texas and know nothing about their absurd belt buckles. The whole issue with having a second brooch on her body actually adds an interesting question for us to ponder: If one of the brooches is only for show, which one is purely decorative and which is the source of her Sailor powers? Read also: How Are the Three Talismans Connected to the Japanese Emperor? Unfortunately, we’ve never been given a clear answer anywhere in the series and, in fact, no one ever even really calls attention to the two-brooch design, so you’re stuck with just my theory today. However, I think there’s some compelling evidence, which I’ll outline as we go. So what is this theory of mine? Glad you asked! If I were to guess, I’d say that the one on her chest is her actual brooch needed to transform and the one on her waist is where the Holy Grail resides and serves as the source of the power to upgrade her from you’re run-of-the-mill Sailor Moon and into Super Saiyan Sailor Moon. Since the anime doesn’t give us much to work with, we’re going to take a look at the manga. 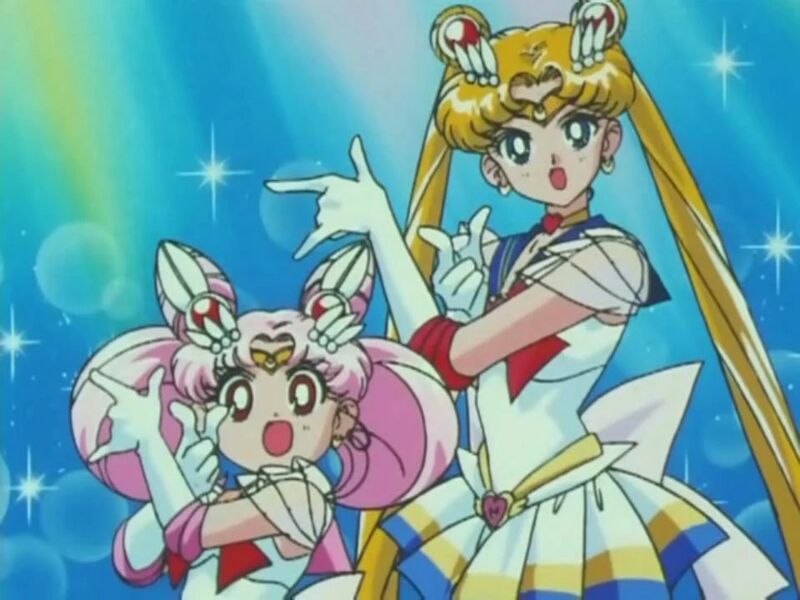 And, specifically, the two different forms of Super Sailor Moon. Yes, that’s right boys and girls. It’s often kind of overlooked that there are two different forms of Super Sailor Moon, and the distinction between them is kind of important. The differences are, essentially, that in the beginning Usagi needed to transform into Sailor Moon and then further transform into Super Sailor Moon. The reverse is also true, in that she can lose her Super (as one sometimes does) and transform back into normal Sailor Moon. Later on, in both the anime and the manga, she gained the ability to transform straight into Super Sailor Moon, thus making this into her new “normal” form. So going back to what I said above, the argument here is that she first uses her own Moon PowerTM to turn into Sailor Moon, then borrows the power of the Holy Grail to power up into her super form, which then joins her uniform as a waist brooch. If that’s true, then we should see a difference in her Sailor uniform when she no longer needs the extra power of the Holy Grail. Whoa, hey, what do you know! 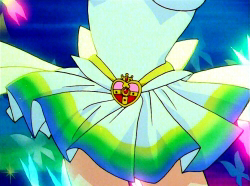 Once she became able to transform straight into Super Sailor Moon, her waist brooch changed from the really decorative one that was a copy of the one on her chest and turned into a simple heart jewel. Read also: What Legal Troubles Were Caused by Moonlight Densetsu? 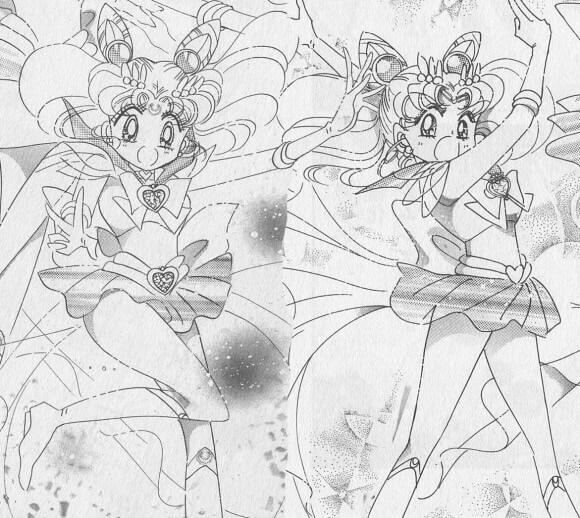 And just for the sake of being thorough, let’s also take a look at Super Sailor ChibiMoon, who also went from a two-step transformation process down to one later one, once she no longer needed her own Holy Grail. Once again, her waist brooch becomes simplified once the Holy Grail is no longer in the picture. Unfortunately, this theory doesn’t really apply to the anime since the source of her ability to transform into Super Sailor Moon is all over the place, from first being due to the Holy Grail (all good) to then Pegasus granting her the power to transform, and finally being given a new brooch to do it directly. And across all these changes, the waist brooch and the one on her chest always match, meaning that this clearly isn’t the source of her power, and is more than likely just a design decision, probably originally intended to conform with the manga design. As I mentioned, we can’t exactly be sure one way or another since this is just a theory, but I think it does hold some water. I personally like it because, frankly, it’s nice to think that the source of her power has to stay on her body – just like her transformation brooch. It also helps distinguish “powered-up” Super Sailor Moon from “normal” Super Sailor Moon. At least that’s my theory! If you have a different take on things, or any idea to help explain away how things work in the anime, I’d love to hear it! ← What is the SuperS Ending Song Rashiku Ikimasho Talking About? Wow, you know, I never even thought about that! That definitely makes it all the more appropriate! This is a phenomenal observation! <3 My mind is running with this and all of its potential implications. This topic has been argued several times on the Internet. 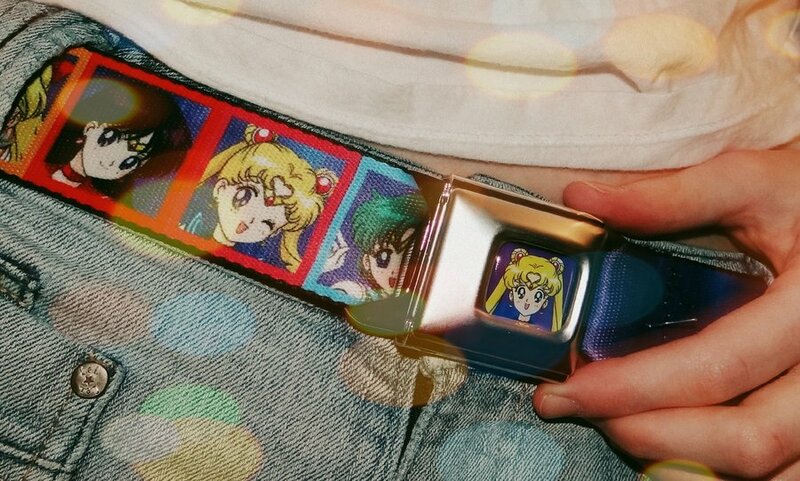 I personally believe that, even in the anime, the broach on Super Sailor Moon’s (or Chibi Moon’s) waist contributes to maintain her Super transformation, even after she became able to transform straight into Super form. That’s because the broach on her waist seems not a simplified copy, but an elaborate duplication of the one on her chest, which implies the waist broach has a certain function related to the transformation. However, there is a situation in the anime which might deny my theory. 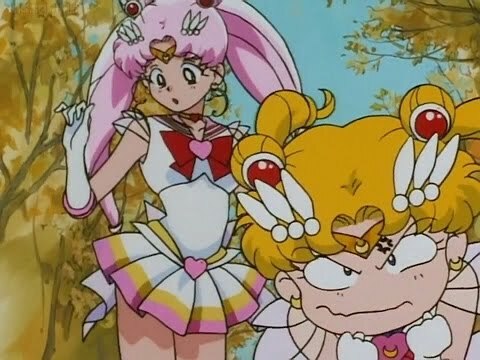 When Super Sailor ChibiMoon was forcibly de-transformed in SuperS movie, she was wrapped in energy ribbons just like Sailor Moon’s detransformation. But the ribbons are emitted only from the broach on her chest, nothing from the waist one… or rather the waist broach was disappeared in her mid-detransforming state. If the waist broach is used for transformation, even in such ribbon-clad state, it must remain on her waist and emit transformation ribbons similar to the chest one. This may be my favorite post yet! (I’m reading through the whole damned blog however many years into it…) I had NEVER thought about this, and I’m banging my head against the wall for having overlooked it this whole time. I love your theory – headcanon accepted! If transformation items remain on the body, then do the henshin sticks of the others become the crystals on their on brooches?